This examination by me of the growth of Sports Direct’s Flannels.com and its rivalry with JD Sports was written earlier this year for Sportswear International. It appears on pages 46-47 of the digital edition here. Since I wrote it Flannels.com has announced a tranche of further openings, including a flagship on Oxford Street that should appear before Christmas 2017. 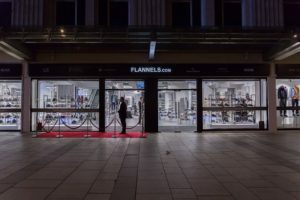 With 20,000sq ft of premium fashion brands across four floors, the latest Flannels.com store is an impressive statement of retail confidence. But this temple of desirability is not in a British fashion hotspot like Glasgow, Manchester or Leeds; it is in Plymouth, a Royal Navy town of around 257,000 people about 190 miles from London in the south-west corner of England. The Devon locals now have the chance to buy the likes of Alexander McQueen, Paul Smith, Versace, Stone Island, Jimmy Choo, Christian Louboutin, Hugo Boss and Giuseppe Zanotti, just like their big-city cousins. Opened in mid-February, the business has confounded sceptics who thought the brand mix was too high by reportedly doing great trade for its owner, Sports Direct, the value-driven sportswear business controlled by controversial founder Mike Ashley. A maverick businessman, Ashley, who started the company in 1982, built his empire on discounting and seems to delight in not playing by the rules. He has had a stormy relationship with the financial world since joining the London Stock Market in February 2007 due to alleged lapses in corporate governance (Ashley still holds 55% of the company). He has had regular arguments with major sports brands due to his policy of discounting. In 2014 Adidas refused to supply Sports Direct with the latest Chelsea replica kit. The company, which has about 450 stores in the UK, has been persistently criticised for using “zero hour contacts”, which give no guarantee of regular working hours to most of its 27,000-strong workforce. (Such contracts are widely used in UK retailing as they reduce ancillary costs, such as holiday pay and bonuses). Sports Direct’s alleged treatment of workers at its huge distribution centre in the English Midlands have been the subject of television and national newspaper exposés. Ashley is currently in a war of words with some British Members of Parliament, who are insisting he attends an official meeting at Westminster to explain his employment policy. At the time of going to press, he had refused to attend and had instead invited the MPs to visit the massive warehouse to see the working conditions for themselves. His belligerent style to business is what worries his critics who are concerned about his now-sizable stake in premium branded fashion, which in the UK is mainly about menswear and is concentrated notably in the regions outside London. Later this year another large Flannels.com store is to open in Swindon, a provincial town of 209,000 about 130km (80m) west of London, and one in Newport in south Wales, which has a population of around 146,000. These confident openings are a clear indication that Sports Direct is on the expansion trail – which is making independent retailers of premium fashion brands very uneasy. Until recently, brands carefully carved up the UK between stockists, allowing an “exclusion zone” that would protect each retailers’ sales. That cosy arrangement has been disappearing since Sports Direct moved into the arena with its acquisition of the USC multi-branded national chain in 2011. The same year it added Cruise, the leading premium fashion chain in Scotland. In 2012 it acquired Van Mildert, which ran premium shops in the north-east of England. It finished its round of upmarket buying in 2013 by taking a reported 50% stake in Manchester-based Flannels, probably the UK’s largest premium indie, with founder Neil Prosser holding the other half. In 2014 it bought the lower-priced Republic chain out of administration and merged it with USC, dropping the Republic name. (In 2015 Diesel stopped supplying USC as the chain was viewed as not suitably premium). These businesses are now grouped together in the Premium Lifestyle Division of Sports Direct. The division’s sales amount to just over £200m (the group’s turnover is £2.8bn). USC runs 56 stores nationwide, Van Mildert has 11 branches, Cruise has 10 and Flannels.com (as the business has been re-branded) operates nine. All new openings for the ambitious group – which aims to create the “premium multibrand retail destination” – will use Flannels.com. Even more surprisingly, last autumn Sports Direct took a reported 25% stake in Four Marketing, the UK’s leading premium branded agency, which for years has represented CP Company, Stone Island and other top-selling brands. Some saw the deal as a “sell-out” by Four Marketing; others thought it was a sensible move for the agency to get closer to a business which, through its various chains, is one of its largest customers. This spring Four Marketing opened its own premium multibrand concept called 18 Montrose, based at 18 Montrose Street, Glasgow. A second branch is due to open in Nottingham – Paul Smith’s home town and an indie stronghold – later this year. Sports Direct’s rival on many fronts from sportswear to premium fashion is JD Sports Fashion, which like Ashley’s business is quoted on the London Stock Exchange. Since 2005, however, despite its public status, 57% of JD has been controlled by Pentland Group, the privately-owned London-based brand house owned by the Rubin family. Alarmed by the fast growth of Sports Direct, Pentland acted to protect JD Sport, whose shops were important customers for Pentland’s fashion brands, such as Kickers, Lacoste and Ellesse. JD was founded in 1981 by John Wardle and David Makin, who lent their first initials to form the company name. They sold their stakes to Pentland to give it the controlling interest. JD made its name selling trainers and still is a leader in sports-inspired footwear through its main JD Sports chain (with more than 350 shops in the UK and Ireland), its 33 more edgy Size? shops and its single Footpatrol store in London for sneaker heads in London. It extended from sportswear into multi-brand fashion back in 2004 with the purchase of Scotts, a 40-strong northern chain. It added 49 more branches when it bought a similar chain called Bank in 2007. Eight units of the more premium Cecil Gee chain were added in 2011, but this name disappeared after mid-2012 when JD bought a 40% interest in Tessuti, a northern-based premium business of five stores, with founder David Light* retaining the controlling stake. The Cecil Gee stores were re-branded Tessuti. In 2012-14 JD bought several small multi-brand businesses out of administration, including the seven-store premium menswear chain Originals Clothing, online footwear business Cloggs and Leeds-based mini-chain Ark. It also bought 20% of online trader Mainline Menswear and 100% of Leeds-based directional indie Hip. The past 12 months have seen JD consolidate its fashion interests in the UK. It sold the loss-making Bank chain of 84 shops to restructuring specialist Hilco Capital in November 2014; two months later it went into administration and ceased trading. JD also closed 11 stores of another multi-brand concept called Open in early 2015 and this spring axed Ark’s seven stores and online business. Scotts now trades from 32 units. JD Sports, which had sales of more than £1.5bn and profits of more than €£100m in 2014-15, said it had disposed of the troublesome Bank chain to concentrate on its expansion in Europe. The two warring British rivals are both very active across the continent, selling sportswear, fashion and outdoor fashion. (Both have sizable interests in this third sector). But the UK remains the main battleground. All eyes are on the pair to see which independent retail business they next acquire. The big question is whether the Sports Direct-owned businesses will avoid the temptation to discount even premium brands, which is a big fear for their smaller rivals. And, of course, it is not just about shops – both firms are very active selling online. Independent retailers fear that Sports Direct in particular will use its buying muscle to force brands to supply them on favourable terms, simply because it is such an important customer. Many fear that it will too quickly discount even premium brands when sales slow. While the businesses both sell womenswear, the male consumer and his devoted loyalty to brands is by far the major prize at stake. While these two large-scale bitter rivals fight it out, smaller retailers in the UK have got to find their own space in an increasing saturated market. Some long-established independents are claiming they will respond by going back to their roots by buying interesting, little-known collections, rather than the predictable brands. They insist a national chain cannot be as nimble or as interesting as a single store run by a sharp retailer. Time will tell who is right. *David Light, who founded Tessuti in 1985, is building up a mini-empire of branded fashion businesses across the Midlands and north of England. In addition to selling 40% of Tessuti to JD four years ago, he bought the six-store Aspecto chain in August 2015 and added Infinities, a 12-strong business, in November. He insists that these are not connected to JD. Light also runs a number of franchises from the Bestseller group of Denmark, some of which, confusingly, trade as Bank, a name he licensed from the administrator of the defunct ex-JD business. Both Sports Direct and JD Sports Fashion have built up a bank of brands. Most now are sold exclusively through their own channels, with very few being wholesaled. JD Sports brands include: Canterbury, Carbrini, Chilli Pepper, Duffer of St George, Fenchurch, Fly53, Gio Goi, Henleys, McKenzie, Nicholas Deakins, One True Saxon, Peter Werth, Sonneti, Source Lab. Sports Direct brands include: Campri, Carlton, Donnay, Dunlop, Everlast Worldwide Inc, Field & Trek, Firetrap, Hot Tuna, Karrimor, LA Gear,Lillywhites, Lonsdale, No Fear, Title, Slazenger, Soviet, SoulCal, Sport 2000, Voodoo Dolls.